Prince Hendryk sat in the forest, his faithful companions by his sides, enjoying an afternoon free of obligations. "How is Anja?" asked Rudy, to his right. "Huh. Fine, I guess. She's probably busy bathing or doing her hair or trying on new dresses again," the prince replied. "You don't seem to be very fond of your fiancée lately," said Adam, on his left. "She's so boring! Her conversation is always gossip, how princess so-and-so looked at that ball, who's going out with whom... I can't take her for a walk in her fine shoes and dresses, least of all to the forest. If I compare her with Amy..."
"What, that girl we used to play with when we were kids? The one who vanished?" "Yes, her. Remember how we rampaged around the forest? That girl was fun!" Rudy shook his head. "We were just kids then. I imagine she grew up to be just like every other princess." "Sure, that's how it goes," agreed Adam. "And I think it's time we returned to the castle, your Highness." He grinned. "Fine. You two go on ahead, I'll be with you in a minute." Rudy and Adam got up, exchanged a glance behind the prince's back and left. They hadn't been gone long when a rasping voice spoke from the shrubbery behind prince Hendryk. "You shouldn't be out in the forest on your own, prince. No one knows what could happen to a pretty boy like you." He turned around fast, to face an ugly witch with a wart on her nose and a grin full of rotting teeth. "What do you want with me, witch?" he asked, his voice barely shaking. "Oh, don't worry, I'm not going to harm you. I just wonder why you're so cruel to a beautiful girl like princess Anja. Don't you think she deserves to be treated better?" "Did you listen to our conversation? That was private!" Prince Hendryk sounded indignant. "What's it to you, anyway?" "Well, you know how it goes. A girl is unhappy with her husband, she goes to see the witch. I'm new, and I like to be prepared." "You think she'll ask you to curse me?" "That's how it works, boy." "Boy! Now that I look at you, I can see you're barely older than me, despite that ugly face." "Will you curse me if she asks you to?" "It's what I do, prince Hendryk. I can hardly refuse a paying customer." "Isn't there anything I could do... to prevent you from doing so? I have more money than she has, you know." "Money's not all, when I think about it... Walk with me awhile, will you? Maybe I can think of something else that will make you worth more than her broken heart." He shrugged, and together prince Hendryk and the witch vanished between the trees. A few weeks later the prince, who had returned from his first encounter with the witch unscathed on the same day, was having an argument with his father, the king. "This marriage has long been planned, you cannot refuse it now!" "Why not? I don't love her, she's boring, I'd hate to spend the rest of my life with her. I'm not saying she isn't a nice and beautiful princess and all that, but she's certainly not my type." "Then you should have thought about this sooner! Now it's too late, in two days time you will be married to her." With a last, defiant "No!" prince Hendryk turned on the spot and stomped out of the castle. "And don't you dare going back into that forest on your own again! I heard there's a new witch about! Listen, Hendryk!" But he didn't listen, and anyway, this wouldn't have been news to him. 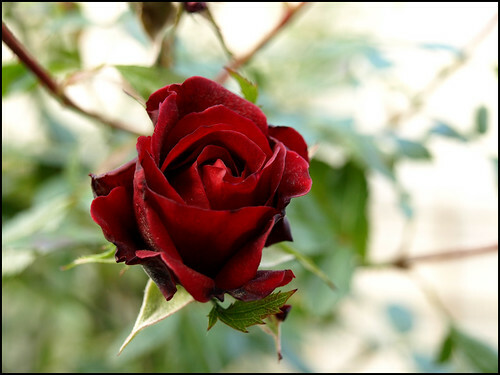 As he left the perimeter of the castle, he passed by the rose garden and, on a whim, plucked a deep red rose. Once he arrived at the forest, he shouted "Witch! Where are you, witch? Show yourself!" "My, my, what's wrong with you, my prince? You look devastated," came her mocking voice from behind a nearby copse. "Why are you visiting me so soon again? Haven't we only seen each other yesterday?" "That doesn't matter," he replied. "Will you go away with me?" He showed her the rose. "You may not be a pretty princess, but you are far more my type than any of them. My parents would never let me marry a witch, but if we went away..."
"Oh no, we can't do that. You are an only child, your parents would be worried sick." "What do you care about my parents? Can't you be the evil witch this once and make us both happy?" "Who says I'd be happy that way, I wonder? I'm not an evil witch, you know, I mostly work with herbs..." Her voice changed, the rasp melting away like the warts on her face and the black on her teeth. "Who am I to take a prince away from his duties?" Prince Hendryk stared. "Your face... Your voice... I know that, you... Amy? How..?" The now not-so-ugly witch smiled at his loss. "How? What choice did I have? I didn't want to be a princess, with all the dresses and balls. I wanted forests and nature, and I wanted to be useful to people, but how could I do that, being who I was? I had no choice..."
"You left to become a witch, but you don't want to do the same for me?" "Oh Hendryk, why should I? I'm a princess, and I think it's time I apologised to my parents. Then you can marry me and we don't have to run away at all." "Oh, don't you see? She doesn't love you, she doesn't want you at all. She came to me and asked me how she could get out of this." "Wait. She...? Does this mean you actually bewitched me? Is that why I love you?" "Of course not, silly. I thought about it, of course, but once I heard you say my name and knew that you still remember me, I thought I could do this without any curses. And I did." She smiled. "Didn't we always love each other?" "Yes, I guess we did... Amy!" Prince Hendryk took her in his arms and hugged her tight. "It's good to have you back." "There's just one problem, though..."
"Yes, how do we explain to my parents that the next queen will be a witch?"